Recently a customer emailed me to ask where I find color inspiration for my cards. I am going to share one of my design tips today! This super cute set has no phrases so combine the images here with phrases from other sets that you love. 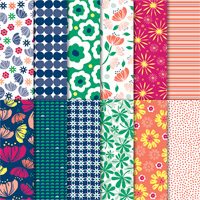 This paper has bold and bright florals and patterns, using the following Stampin' Up! colors: Call Me Clover, Calypso Coral, Lovely Lipstick, Night of Navy, and Pineapple Punch. So I chose two of these colors for my card. During my video I mention a stamping term: fussy cutting. 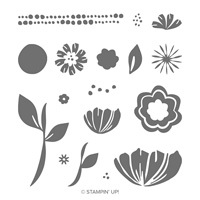 Basically this means stamping and cutting out images using your paper snips, which is how I created the flower images for my card. A pair of high-quality scissors is a crafters must-have so don't cut costs for this item! And as promised, here's how I decorated the inside of my card - using one of the small stamps in the Bloom by Bloom set.